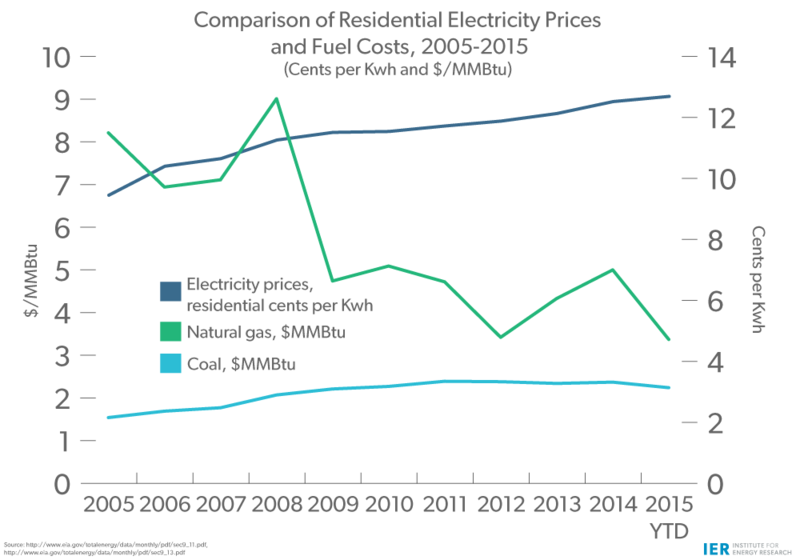 Over the past 10 years, electricity prices have been going up, while over most of that time, the costs of coal and natural gas—the two major fuel inputs to electric generation—have declined or stayed relatively flat. This anomaly is caused by the growth of more expensive renewable energy (wind and solar power) and the onerous regulations that the Environmental Protection Agency (EPA) is forcing on electric utilities that require capital investments to be made to existing generators. This trend has occurred at both the national level and in states like Colorado, and has happened when U.S. electricity consumption has stayed relatively flat or even declined. National average numbers, however, mask what is happening in certain states where relatively inexpensive electricity is now skyrocketing in price. For example, Colorado’s average electricity price has increased 67 percent between 2000 and 2014, while the inflation rate increased by half that amount—34 percent—and the median household income increased by even less—24 percent. [ii] (See graph below.) Coloradans are now using more of their incomes to pay for electricity, leaving less to pay for other things. An increase in electricity rates for all sectors—residential, commercial, industrial, and transportation—throughout Colorado contributed to the across-the-board growth in prices. 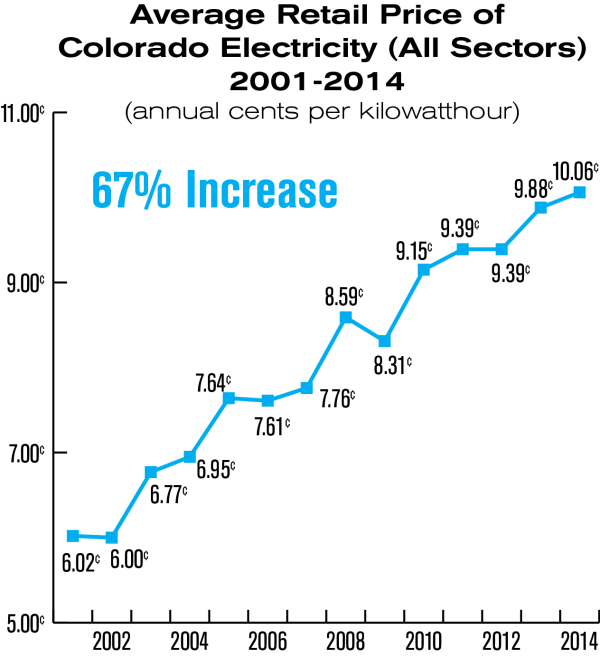 Retail residential electricity rates increased from 7.47 cents per kilowatt hour in 2001 to 12.18 cents per kilowatt hour in 2014—a 63 percent increase. The median income in Colorado, however, went up just 24 percent, from $49,397 to $61,303 and it had actually declined between 2008 and 2012. 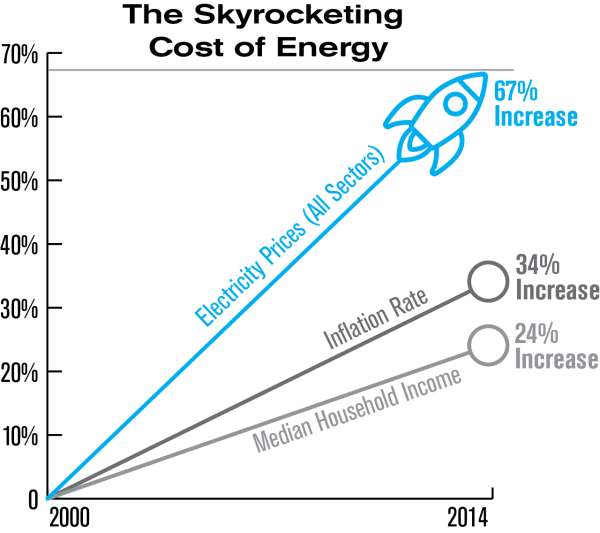 Using the agency’s CPI inflation calculator, the U.S. Bureau of Labor and Statistics projected just a 34 percent increase in inflation for the 14 year period. Regulations imposed by state and federal agencies (e.g. renewable mandates and the Mercury and Air Toxic Standards) have inflicted increased costs on ratepayers and taxpayers without much concern as to their energy affordability or reliability. These policies hurt those most vulnerable—the elderly, minorities, and the poor—since these communities are the most sensitive to increases in energy costs. Further, business owners faced with these escalating prices will either have to pass these cost onto consumers, who are already hit with increased electricity rates, or relocate to where energy prices are lower, forcing layoffs and harming the state’s economy. Because Colorado was well ahead of the curve on President Obama’s war on coal, the state’s rate increases are greater than the nationwide average. As part of President Obama’s war on coal and commitment to carbon dioxide reductions, EPA finalized its so-called Clean Power Plan (CPP) in August 2015—a regulatory morass that many think is illegal. Twenty-seven of the 47 states affected by the CPP have legal challenges to the agency’s authority and recently the U.S. Supreme Court issued a stay to the policy until the courts could hear the arguments and rule on the legality of the regulation. The CPP is requiring the 47 states to collectively reduce carbon dioxide emissions from electric generators by 32 percent in 2030 from 2005 levels. However, each state is given a separate target by the EPA with many of the coal generating states being assigned reductions that are much larger than the 32 percent. As a result, electric generators in these states will have to prematurely shutter coal-fired plants and replace them with plants that produce less carbon dioxide—most likely wind and solar power plants that need natural gas or coal-fired plants to back them up when the sun is not shining and/or the wind is not blowing. Further, the reductions that the United States makes will quickly be scooped up by China—by far the world’s leader in carbon dioxide emissions—or India, who will surpass the United States as the second largest carbon dioxide emitter, since neither country expects to make reductions in their carbon dioxide emissions by 2030. China expects to peak carbon dioxide by 2030 and India will not agree to a firm reduction. Both countries need to bring electricity to many residents that do not have access to it and coal is the least expensive way to accomplish that globally. Thus, EPA wants U.S. consumers of electricity to pay escalating prices as the above graphs indicate just so countries like China and India can emit more carbon dioxide, in hopes they will start reducing carbon dioxide sometime down the road. Further, while the regulations on carbon dioxide emissions would shut down roughly 40 percent of America’s coal-fired power generation, the end result would be just a 0.01 degree Celsius reduction in global temperatures by 2100[iii]—hardly a reason to cause U.S. electric consumers such financial pain, which impacts the elderly, minorities, and the poor the most. Electric rates are increasing nationally and to a greater extent in certain states, such as Colorado. These increases are caused by onerous regulations that result in shuttering existing coal and nuclear plants prematurely and replacing them with new plants that are higher in cost. Electric rates will continue to escalate as EPA imposes more regulations, such as its regulation of carbon dioxide emissions from power plants. Consumers need to be aware that their electric rates will increase for very little gain as other countries will surely increase their carbon dioxide emissions as they provide electricity to their citizens to improve their quality of life.